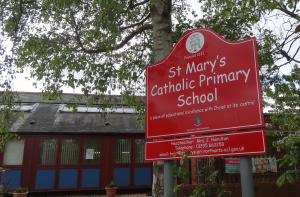 Chalmor’s lighting upgrade and water heater controls enable St Mary’s Primary School to save £1,185 on their energy bills and cut CO2 emissions by 5.31 tonnes per year. St Mary’s Catholic Primary School is a small, rural, school in Aston le Walls, Northamptonshire. They used a Salix 100% interest-free loan to reduce their energy costs and environmental impact by investing in Chalmor energy saving lighting, lighting controls and water heater controls. “Without the Salix funding, our school would be in the dark. Ancient light fittings were becoming obsolete by the day and replacement parts more difficult to find” Janice Hamilton, Head Teacher commented. Chalmor provided a lighting survey, commissioned by Northamptonshire County Council and identified further potential energy savings through water heater controls. Projected savings were calculated to fulfil the 8 year Salix loan payback criteria. The new system replaced existing T8 fluorescent lighting with more efficient T5 fittings and 2D lamps were replaced with LED upgrades. These were fitted with a variety of occupancy and light level controls throughout the building. In addition, water heater controls were fitted to tea boilers, saving energy through heating water according to occupancy, rather than continuously. All works were undertaken within the school holidays, including recycling the old fittings. Electrical load was reduced by 61% from 16,223 kW to 6,284 kW. This will save St Mary’s Primary School £1,185 per year, which equates to £16,839 over the lifetime of the project. The Salix Loan will be paid back over 8 years, using the savings from reduced energy bills. Carbon will be cut by 5.31 tonnes per year and 75.64 tonnes over the lifetime of the project. In addition, St Mary’s Primary School benefit from a greatly improved learning environment and reduced maintenance.